Chania, Crete is one of the best places in all of Greece for food. Here, you’ll not only find your favorite Greek dishes, but also local Cretan specialties. 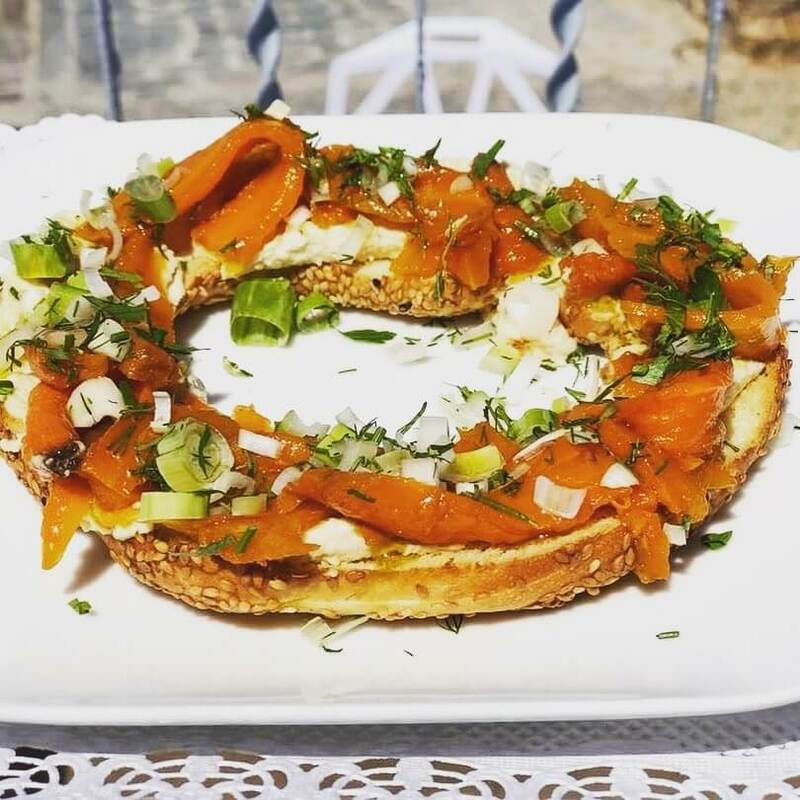 I just spent a month eating my way through Chania to bring you this list of the best Chania restaurants. One of my favorite things I discovered about Greek restaurants in general was their willingness to do half portions. Most Chania restaurants serve large plates, so a half salad and a half entree was typically more than enough food! One of the things you’ll quickly notice on Chania is how late the locals eat. Dinner in Crete usually begins around 9 p.m., but can start much later. It’s not uncommon to finish dinner after midnight. 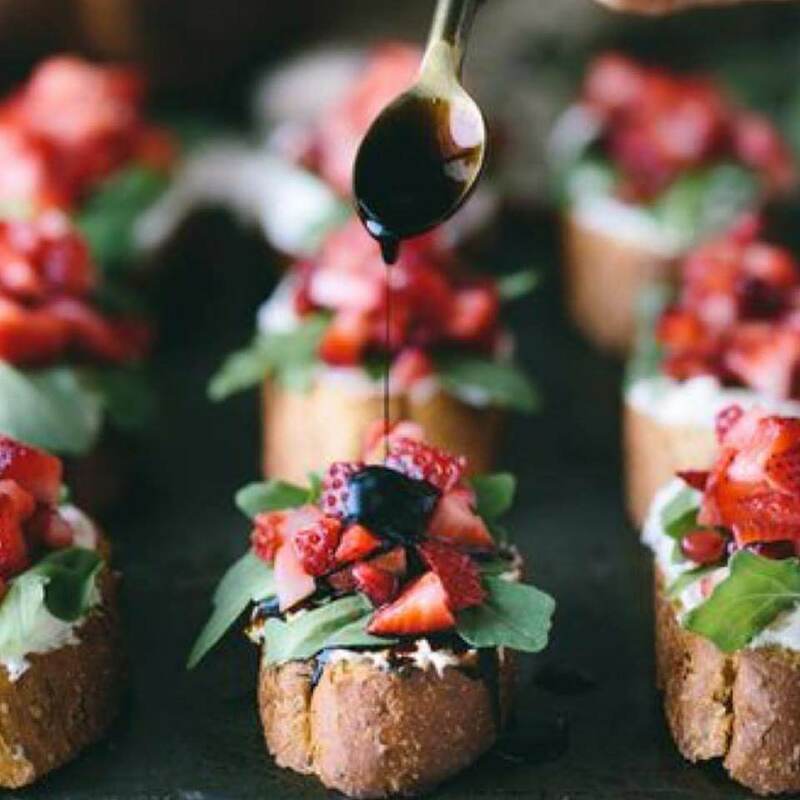 Meals aren’t hurriedly consumed— they’re meant to be lingered over: multiple courses shared with friends and family over carafes of house wine. I love to eat like this! In the month I spent in Chania, I ate at Portes more than anywhere else. 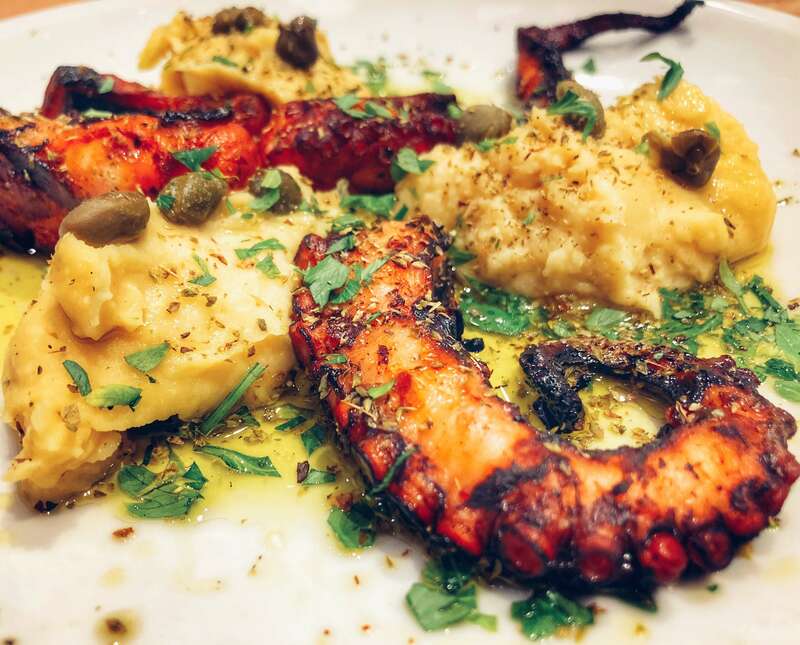 The menu is full of not only classic Greek and Cretan dishes, but also some interesting twists on those classics. The restaurant has two tiered outdoor seating on top of their indoor restaurant dining area. If you’re in for an early dinner, ask to be seated on the upper tier, where you can catch some some impressive sunset views. 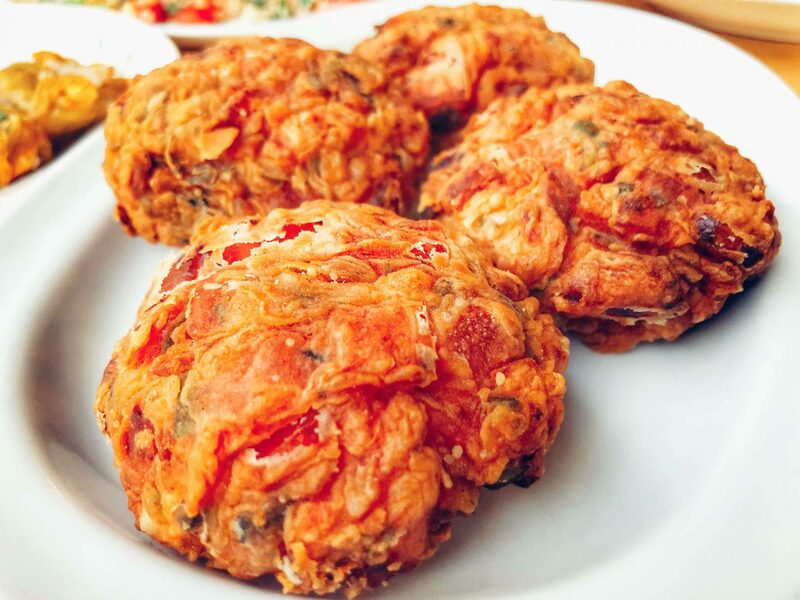 Be sure to try the tomato fritters, stuffed zucchini flowers, grilled octopus and fava—all favorites of mine. And don’t forget to order some house wine to enjoy with your meal. Portes has some of the best house wine of any Chania restaurant I tried. Also, make sure to ask about any daily specials, especially their fresh fish options. While I never saw it on the menu, if the fish burger is on special, you have to order it. But to be honest—you’re going to love whatever you order. Located in the heart of old town Chania, this is one of the first restaurants that I discovered will do half portions. I returned several times to sample more of their menu. The friendly service had a lot to do with my multiple visits, and by my second meal there, the waitress was treating me like a regular. She even remembering what I had previously ordered. I suggest you try the lamb, as Enetikon is known for their roasted meat dishes. Or, like most of the restaurants on the island, you can’t go wrong ordering seafood dishes, including a dish of Cretan snails in rosemary! 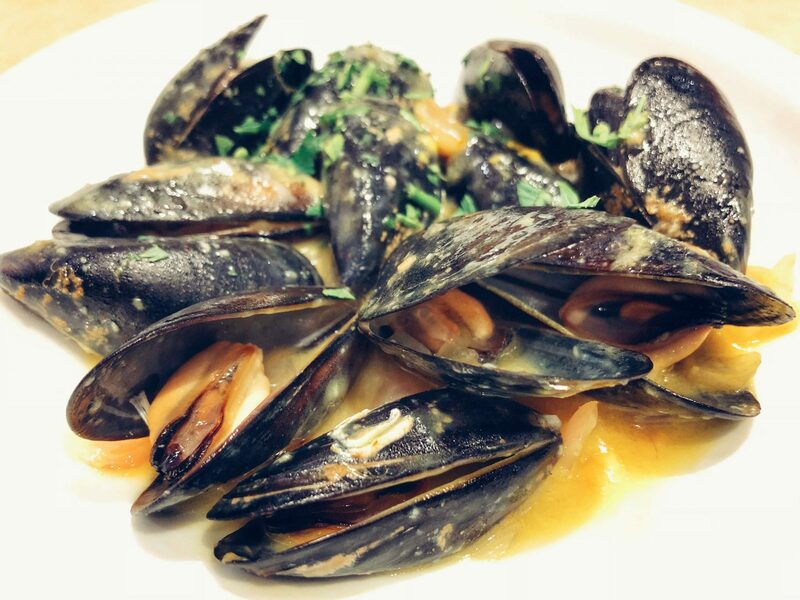 For those less adventurous but still in a seafood mood, look for the steamed mussels. 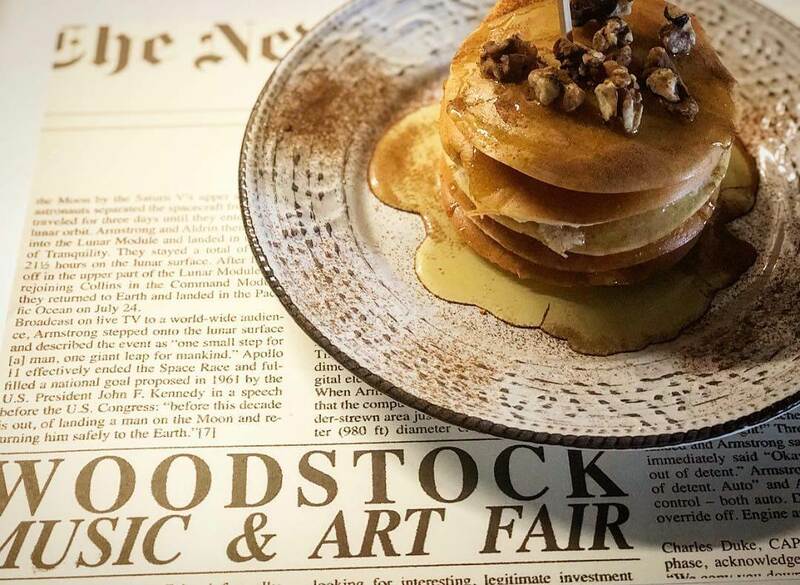 I’m sure Woodstock also serves some great dinner, but I only ever visited them for breakfast or brunch. Their location has one of the best views of the harbor from seats overlooking the water. Options include pancakes and waffles that would be hard to resist if you’re looking to have a sweet start to your day. Also, my coffee drinking friend said the cup he had was some of the best coffee in Chania. If you’re more of a savory person (like me), I recommend the spinach and chicken omelet served with a side of crispy roasted potatoes. My apartment was located over Pulse, so I was fortunate enough to try much of their menu. This isn’t your typical, boring vegetarian and vegan food. Pulse serves a full menu from lunch until dinner. The restaurant is located just on the edge of the Old Town and has a casual atmosphere. It almost feels like like you’re eating on the patio of a friends house and lends itself to long talks over wine. Even if you think you’re not a fan of vegan or vegetarian dishes, drop in and give this place a try—I think you’ll be happily surprised. Several times during my stay, I sat over the water enjoying a slow dinner and watching the sunset while sipping on house wine. I can’t wait to go back. The menu features a wide range of fresh seafood priced by the kilo or serving. Here, you can find everything from grilled swordfish to fried shark, grilled or fried sardines, octopus and even lobster. This is a great place for an anniversary or birthday dinner. Ginger Concept is open all day, so you have lots of opportunities to sample their incredible menu. You can start your day there with designer toast options, including a Reuben with slices of grilled beef or smoked salmon and avocado toast with horseradish cream cheese. The menu also features a Croque Madame made with Edam cheese, a Spanish omelette stuffed with chorizo sausage, or their own version of a classic Greek breakfast. If you prefer a lighter start to the day, you can also order yogurt or acai bowls. Later in the day you can visit for aperitivo to try their wide range of tapas paired with wine or a cocktail from their impressive list. 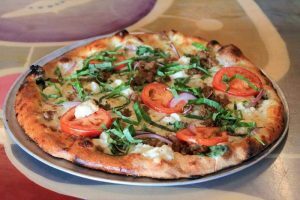 If you’re in the mood for a dinner that’s more substantial than tapas, they also offer pizzas, pastas and even beef bourguignon. You’ll likely pass Tamam as you’re exploring the streets of Chania’s old town. When you pass, go ahead and pop in to make a reservation, as this place fills up at quickly at night. 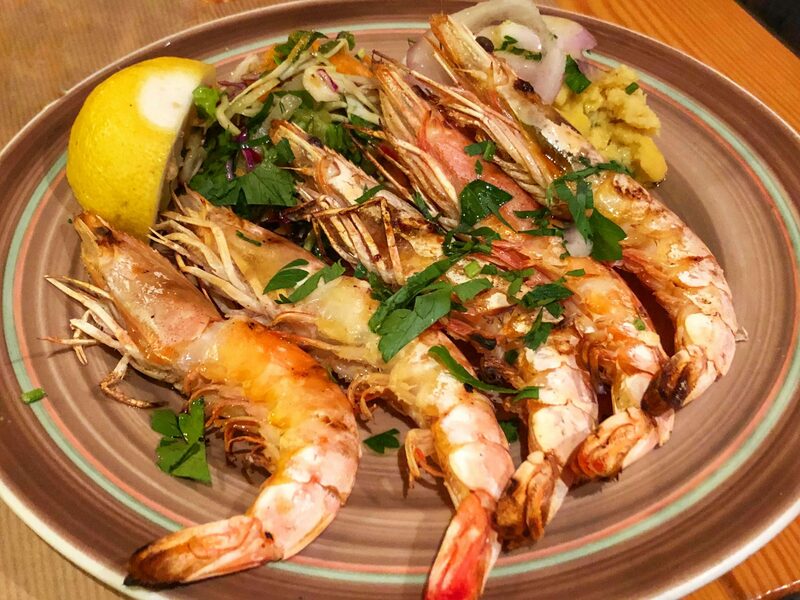 The menu at Tamam is inspired by the traditional Greek Sunday dinner, meaning you’ll find traditional, homestyle meals made from top quality local ingredients. Try the rabbit cooked in sweet wine with rosemary, basmati rice flavored with dried fruits and vegetables, or one of their several perfectly executed seafood dishes. Their wine list features many Greek wines with a focus on bottles from Crete. Be sure to ask your waiter to recommend a bottle for your dinner. Evgonia is located a bit out of the way but is well worth the effort to find. This is a great place for neighborhood dishes with a menu that isn’t extensive but does feature some classic Greek favorites. The portions are large—if you’re dining alone, you definitely do not need a salad, appetizer and a main. I discovered this for myself! Be sure to ask about half portions if you’re a solo diner or your table doesn’t want to split. Their menu describes themselves as “an eclectic mix of Greek, Turkish and Middle Eastern cuisine” and this description is spot on. 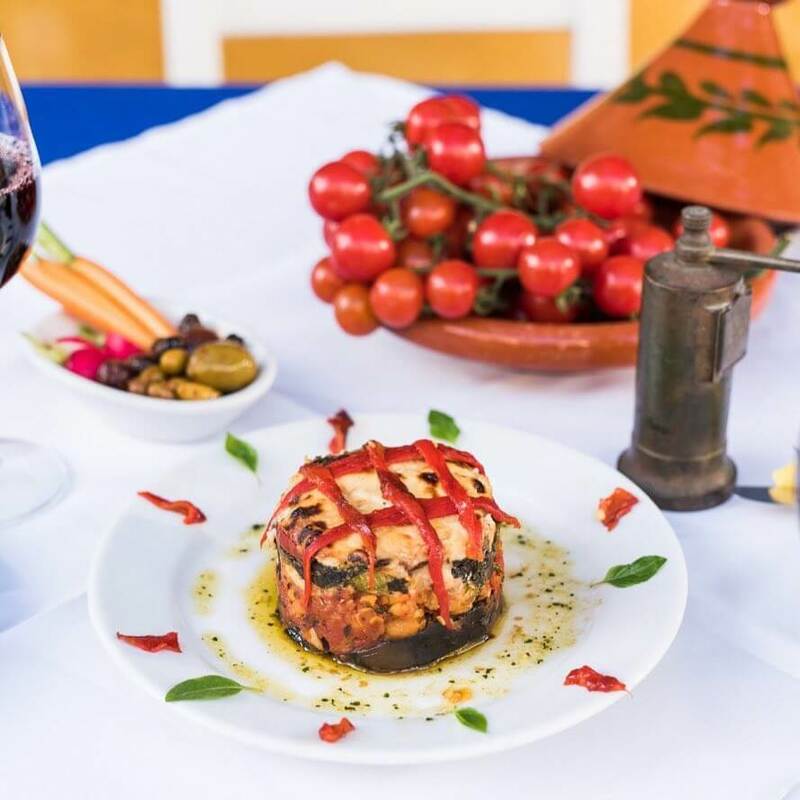 Here, you can find slow cooked local lamb with preserved lemons served over couscous, shish kebabs served with an avocado and orange salad, lamb pizzas or this vegetarian moussaka. 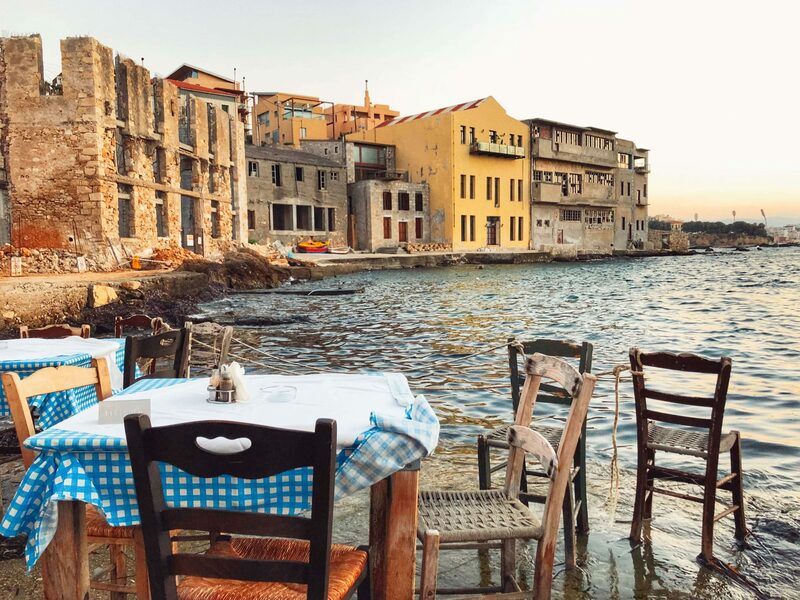 Weather permitting, try a seat on the outdoor patio—they’re located in the quieter part of Chania’s old town, and it’s a nice place to sit and enjoy a long dinner. One of my favorite places in town to try authentic, no frills homestyle Greek dishes, this restaurant features a daily changing menu of homemade selections. Kouzina is a great place for lunch or an early dinner. The meals are prepared just as you’d expect a Greek grandmother to. 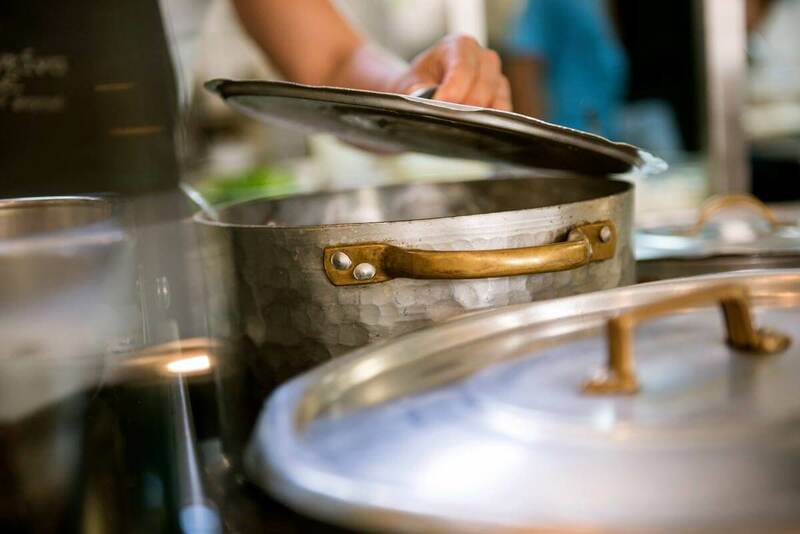 Ask the server to explain what’s available that day—they’re happy to give you a peek under the lids of pots. My favorite was a beef chickpea dish in a tomato sauce—be sure to look for it when you visit! This jazz bar located in Old Town serves great drinks and large pours of wine. What else do you need to know? This became my go to place in Chania (and it didn’t hurt that it was located literally right out the front door of my apartment). I love their laid back vibe, great music and interesting cocktails. Several locals cited this as their favorite bar in town and the place they go to unwind. Another jazz bar, this one also serving great cocktails. You can find Fagotto tucked away behind the Maritime Museum. Fagotto also seems to be one of the bars open latest in town, making for a great stop on the way home for one last drink. 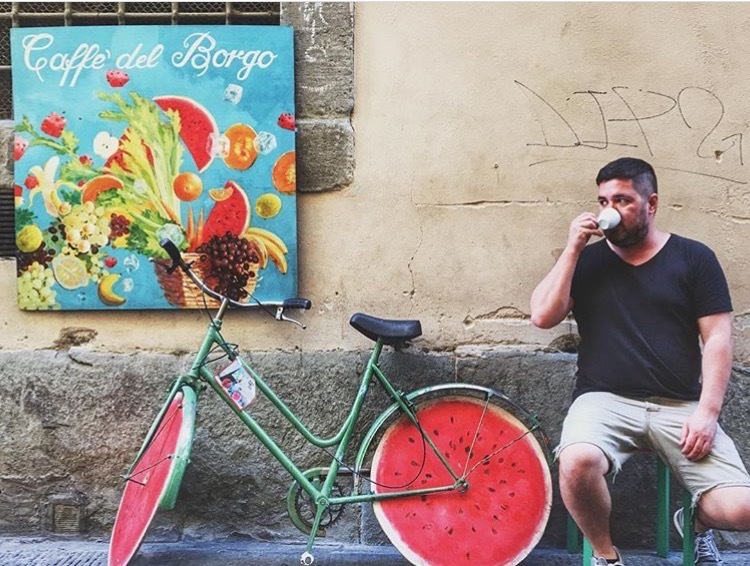 Although I never had the chance to try it, I heard Fagotto also serves a great breakfast as well. 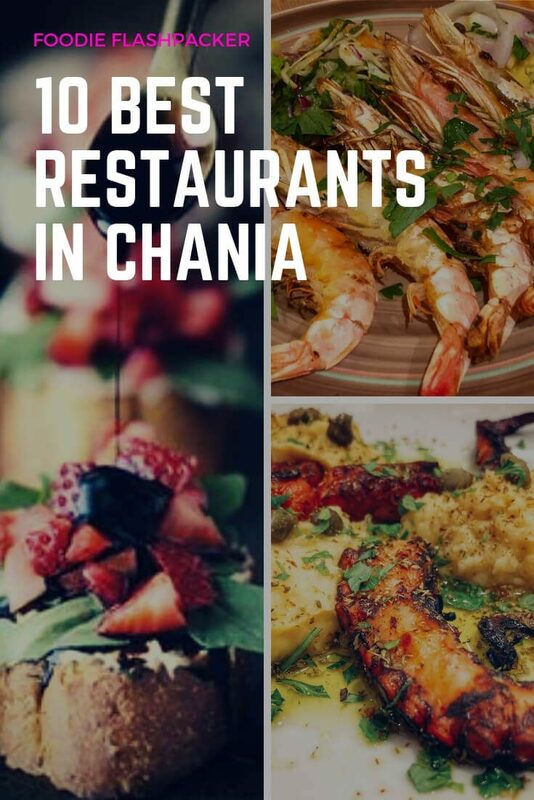 Which of these Chania restaurants do you most want to try? Let me know in the comments section below! They’re both so good! I can’t wait to go back. I was actually living over Pulse during most of my stay so I was lucky to try a lot of their menu. Everything was so good! When I lived in Chania in the old harbour I ate a lot at Portes when they had the restaurant there, always excellent & I noticed in the height of the season tourists would have to wait for a table as Portes had such a good reputation. Hope they’re doing as well at the venue they are at now . They seem to be doing really well- always busy. No surprise- their food is amazing. I can’t wait to go back! They moved to neo hora..
Kouzina EPE is my favorite Greek restaurant! That strawberry dish looks good. Do you know what it’s called and what both the leaf and drizzle is?